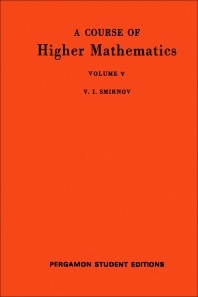 International Series of Monographs in Pure and Applied Mathematics, Volume 62: A Course of Higher Mathematics, V: Integration and Functional Analysis focuses on the theory of functions. The book first discusses the Stieltjes integral. Concerns include sets and their powers, Darboux sums, improper Stieltjes integral, jump functions, Helly’s theorem, and selection principles. The text then takes a look at set functions and the Lebesgue integral. Operations on sets, measurable sets, properties of closed and open sets, criteria for measurability, and exterior measure and its properties are discussed. The text also examines set functions, absolute continuity, and generalization of the integral. Absolutely continuous set functions; absolutely continuous functions of several variables; supplementary propositions; and the properties of the Hellinger integral are presented. The text also focuses on metric and normed spaces. Separability, compactness, linear functionals, conjugate spaces, and operators in normed spaces are underscored. The book also discusses Hilbert space. Linear functionals, projections, axioms of the space, sequences of operators, and weak convergence are described. The text is a valuable source of information for students and mathematicians interested in studying the theory of functions.